With 27 consecutive house sits behind us over 3 years across 4 states, this is what we learned. It has given me time to indulge a passion for science and scratching an itch to write. This ‘danzblog’ you are reading now, is part of that, allowing me to not only record our journey, but to express my views on a few other subjects and pass on some pearls I’ve garnered over a 40 year working lifetime. Before we begin, it is important to realize that house sitting is an equal and fair exchange based on mutual trust and respect. The emphasis here is on the word ‘mutual’ that is to say, not all house sitters will be the best they can be and not all home owners will necessarily have the best motives either. In putting together his guide, it is written with the greatest respect for those for whom we have had the pleasure of helping to solve the problem of looking after pets, gardens, livestock or other obligations. In exchange we have received the chance to explore new areas, meet new people, make new friends and enjoy the company of a few feathered and furred treasures. And like babysitting the grand kids, it’s nice to hand them back to their parents. An excellent profile text with intelligently selected photos. A well written ‘first contact’ template with lot of options. A rejection template to regretfully decline offers. 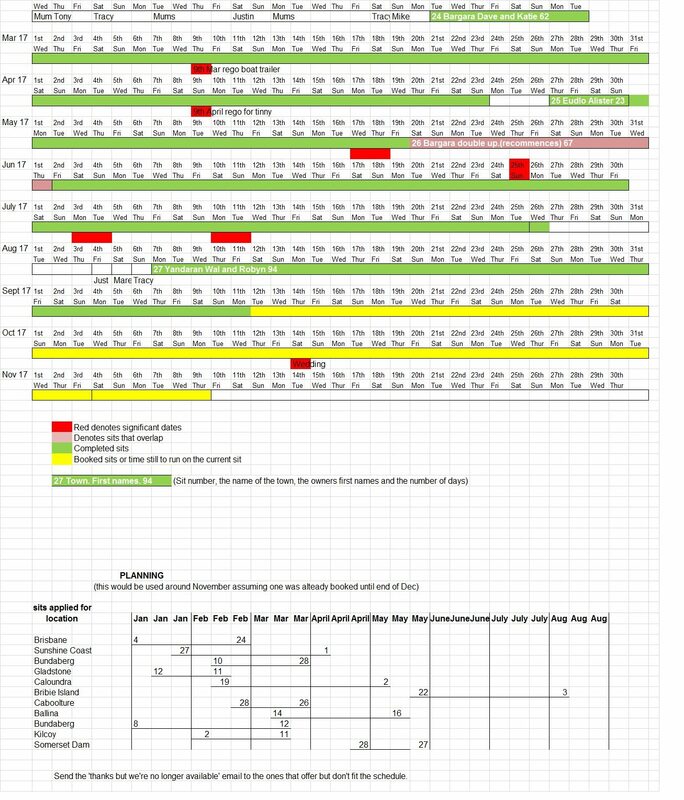 A spread sheet schedule of sits, past, present and future. You will also need to know these 10 ‘rules’. 1 Having a good profile is king. Pay much attention to it. The text of the profile will give an impression of you that may be quite different to the way you read it. Get others to read it and see if they ask questions. If so, potential home owners will ask them too. Be especially vigilant about spelling, punctuation and grammar. Better they think you are smart and well educated. 2 It’s counter intuitive, but your profile is more about the home owner’s ‘hot buttons’ than it is about you. This is not easy for them either. Address the concerns that you would have if you were looking for a house sitter. What would you worry about? Will the sitter love my pet, be clean, honest and look after the house? Will the sitter cancel and leave my holiday plans in pieces? 3 Put lots of photos on your profile especially pets sleeping on your lap and/or taking walks/exercise. If you’re interested in doing farms, a tractor shot is more than a good idea. They are not interested in your favourite selfie, on holidays in Bali or Hawaii. 4 Create a long ‘first contact’ template with lots of options (relating to location, unusual circumstances, timing etc) that you can edit to suit the house owner. Personalize it and refer to their pets, if they have them, by name/breed if possible. Your first contact should read like you are a potential new friend. 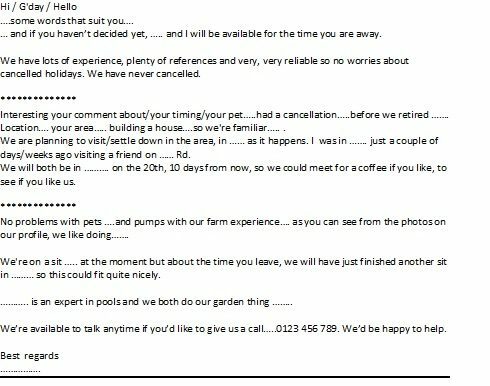 Treat the owner with respect by not including comments about pools/pets/farms if they are not part of the description, nothing that is not specifically mentioned in their ad, but DO address everything in the ad. They don’t care about what else you have done. 5 When making the first contact, don’t offer too much, don’t gush or sound desperate, just keep in your mind as you apply, that you are good at what you do and proud of leaving a place better than when you arrived. Be confident but not arrogant, offering to help, not telling them what you want. They are not interested in what you want. 7 Organize your sits up to a year in advance. Be aware that 30% cancellation is not unusual. Things change, people get sick, weddings are cancelled. Lots of things change, but you don’t because you are super reliable. Be aware that sitters cancel too so emergency sits pop up all the time. Sometimes with only a few weeks’ notice which means you can nearly always fill an empty spot. 8 Be picky about the type of sit to apply for. Avoid those who sound bossy, boastful or demand ‘police references’ or don’t want you to use the house or expect you to pay the power bill. It shows they think you should be grateful or resent that you might be getting a benefit and/or can’t be trusted. Don’t waste your time. They’ll get some desperate to do the sit and reduce the competition for the good jobs. 9 Select sits by areas that stretch your limits. Select a large area up to 1,000 kilometres long or 300 x 300 kilometres. Apply for all suitable sits of more than three/four weeks and enter them in your planner spread sheet. Select another area and repeat. Apply for both areas at the same time. 10 Respond to all replies immediately, putting all positive offers on hold for 24 hours if possible by showing you are ‘very interested but can’t commit until check the date on another assignment which will almost certainly be true if you have paid attention to your profile and ‘first contact’ template. Use the enthusiasm and warmth of the responses plus the prospect of fun, to help you decide to which area you prefer. Example of schedule spread sheet and below, a planning spread sheet. The secret is to care, but not care too much. Home owners are generally more likely to make an offer to someone who is in demand, than someone that no one else wants. They should feel it’s just a lucky break for them that you, the first class sitter, happens to be free just when they need one. Lucky eh? When you get to talk on the phone for the first time, be friendly, confident, joke and smile a lot. I know they can’t see you but they can feel your attitude. They really want someone friendly, happy and reassuring. So that’s it. All you need to know about how to be a successful house sitter. Although I probably shouldn’t give away too many secrets and I’m not giving you a copy of our profile, this is the basic format we use for the first contact. You can make it your own by putting your personality into it. Good luck in your travels and here is a link to AHS. The other links are a few random travel articles from our adventures you can also find listed under the headings at the top of this blog. I also have a basic template for applications and change it to suit the advertised assignment. So far, we have had 30 house-sits and have not had to cancel..but have had 3 sitters cancel on us for various reasons. We just had to be flexible as it was too short a notice to get anything else. Thank goodness friends were nearby to accommodate us plus there is always a motel. Thank you Dan for this great article…I will take on board all your pointers. Atm have aquired Sits via word of mouth through friends (I’ve just ” fallen into” this awesome existance) and loving it. I’m pleased you’ve found it interesting. Great to get positive feedback.